In 2006 I was new to wildlife and nature photography, just getting going, just starting to learn the ins and outs of my camera, of subjects, of trying to see a subject and make a unique and good image. This image is far from perfect, but it was an accomplishment at the time. It was taken with my Nikon D200 and the original 80-400mm lens. In 2008 I wrote a post on how to get the most out of the 80-400mm lens, I think many of the tips hold up today and with any lens. In 2010 I had been going to Great Falls National Park for a few years, and I would photograph the bald eagles up river from the falls, as well as the herons. 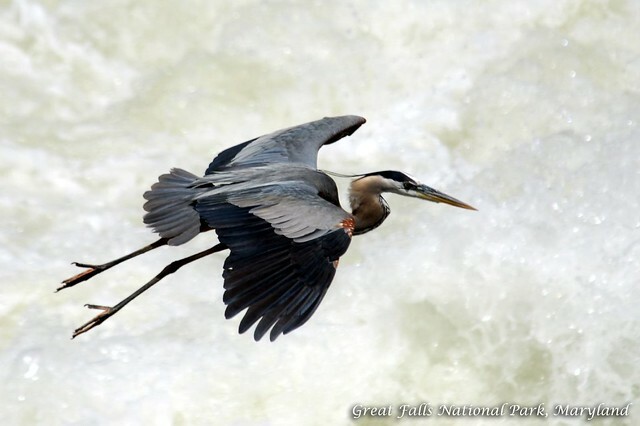 The below heron image is one of my all time favorites, of any subject. 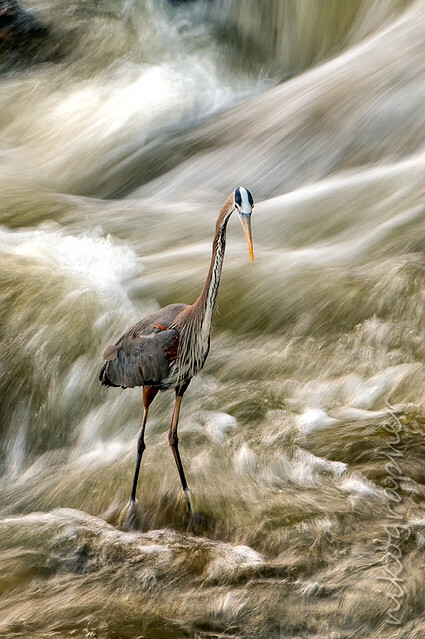 It took many visits to get a proper balance of light to allow for a slow enough shutter speed, and to have water flowing in such a way that the bird would be in a good spot with some dynamic patterns in the background. D300s – 400mm, f/13, 1/8th of second. A much more common photo from Great Falls is this one, with bubbling flows of water and herons gliding past. 2006 – D200 80-400mm, f/6.3, 1/800th. For more years than I would have liked I shot in jpg format. I didn’t shoot raw! The main issue was that the tools I had to edit files made it hard to produce an image I liked as much as I could get from a jpg. So I went with jpgs. Later I shot both formats, and eventually I switched to only shooting raw. Using Lightroom to edit images made all the difference. 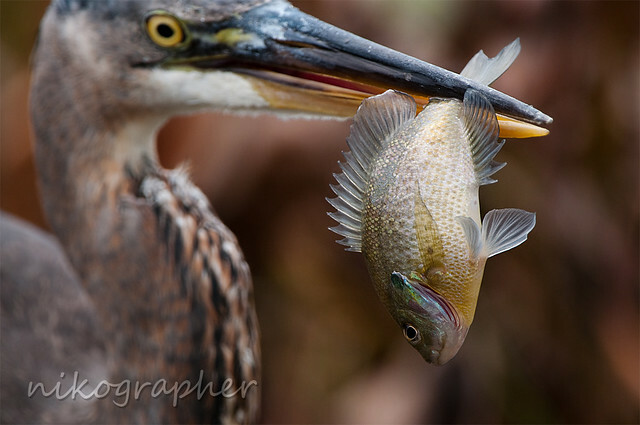 In 2008 I got this unique to me so far image (after some friends at Blackwater NWR mentioned they had just gotten a heron who snagged 2 fish at once). I found the same heron and he did it again! 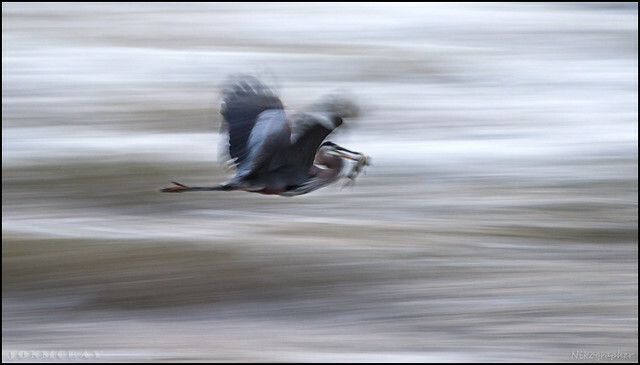 In 2009 I made friends with a local heron and he was amazing to watch and photograph. D300 – 35mm. Standing a few feet away and using a relatively wide angle lens, I liked how the splash made for a unique image. This heron was a very good fisherman, and would let me shoot from so close without disturbing him. It was one of those things, if you can find a bird that is ok with being watched, take full advantage of it, and make lots of images! I photographed him for a little over a year I think, and then he was gone. D300 w/ 200-400mm w/ 1.4xTC (at 460mm), 1/320th, f5.6. Looking at those settings I’m surprised at the sharpness. I have a tendency to shoot slow shutter speeds to try to keep noise down, and to sometimes allow for motion around the edges where that adds to an image’s aliveness. Freezing action completely is not something I usually go for. I saw this National Geographic image and story by Nick Nichols in 2006 and have never forgotten the blurred Panda. 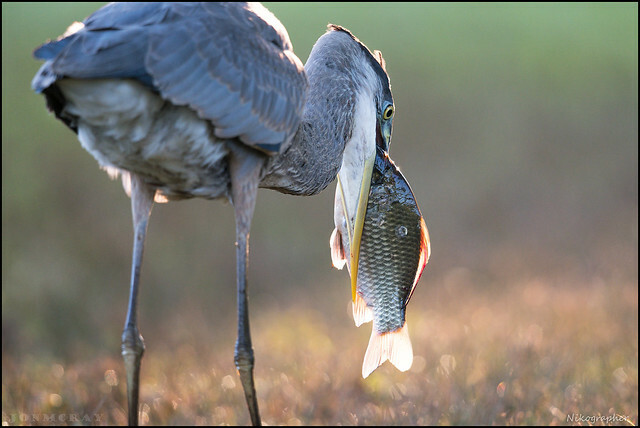 During the summer of 2017 I found another somewhat friendly heron, and shot him a bunch. Putting this post together I can see how my eye and technique has evolved. And how my images are now cleaner, and better. 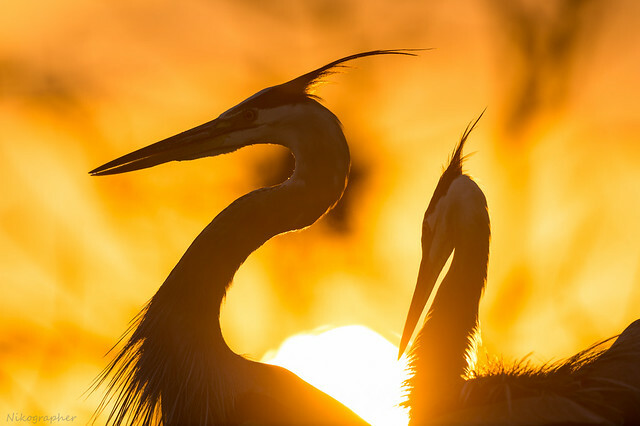 Finally, one of my favorite heron images is this one from Wakodahatchee Wetlands in Florida, in 2015. It’s taken at sunrise shooting right towards the sun. The two adult herons are sitting on the nest where there’s a chick (below and out of frame). I’ve been back to this exact spot more than once and not been able to reproduce the light/birds/resulting images. However, when I first saw the setup for the above image – it was a year earlier, and someone else was standing in this exact spot, and I didn’t try to shoot over his shoulder or crowd in on him. I waited A YEAR, and tried again on my next trip to Florida. Luckily it worked out, because this is among my favorite images/sequences. D4 w/ 600mm f/4 – f/4.5, 1/1000th, ISO 100. 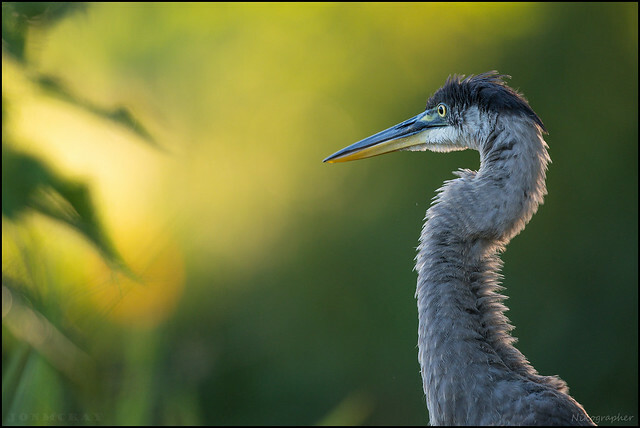 See more of my GBH images on flickr. Do you have a favorite image from above? 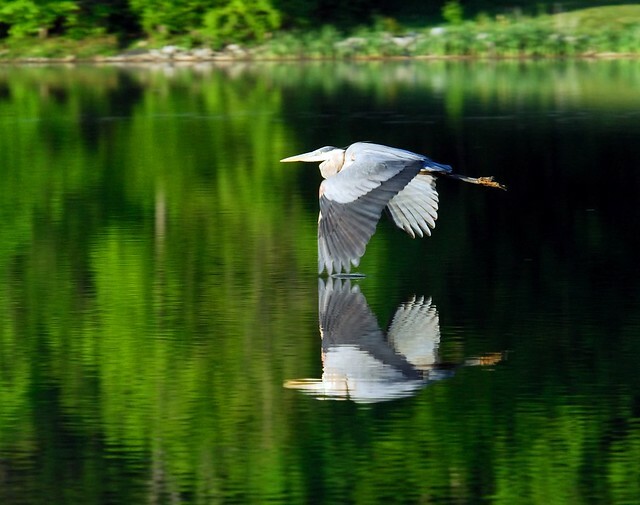 Or a heron image of your own? Let me know in the comments.